Nothing like ole' murder mystery, am I right? On top of that, there’s nothing like a Kuroshitsuji murder mystery. I’ve been dying for a good mystery anime for a while since Gosick, so being a Kuroshitsuji fan and finding out that A-1 was going to produce more Kuroshitsuji (this time being a mystery) I was ecstatic. And if you’re not a mystery fan but you are a Kuroshitsuji fan, these two part hour-long episodes might quench your Kuroshitsuji thirst since Book or Circus. By the way, I'm not going to go way into depth in this review as this anime was only two hours long haha. If you’re a fan of murder mysteries, than you can already guess the premises of what these two OVAs entail. 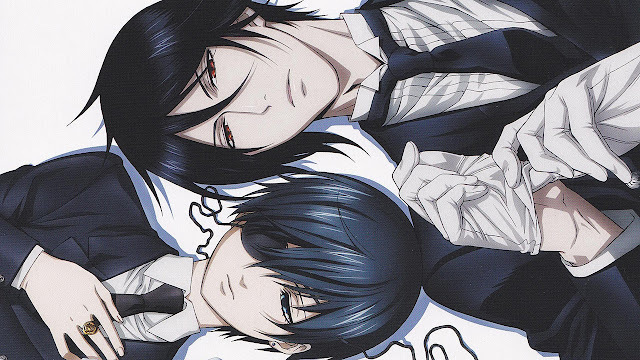 The Phantomhive household hosts a lavish dinner party with a selected amount of guests. As you might have assumed, a selection of the invited guests get surprisingly murdered on scene at the Phantomhive mansion by presumably one of the remaining party guests, the household gets locked down and the search for the one with blood on their hands beings. So there’s not much proprietary in terms of concept, so throughout the majority of the 2 episodes I was kind of in between entertained and bored. Not to mention the amount of cliché tactics you find in any mystery genre were thrown into this, so that did not help. Overall: very short review for a short two-part episode series and good murder mystery. There’s nothing special about your typical murder mystery but there is something proprietary about a murder mystery that involves a highly intelligent boy and a demon that can perform actions that can surpass the physical limits of the average body. And for that reason, I enjoyed watching Kuroshitsuji: Book of Murder for that supernatural mystery aspect compared to a pure mystery. Worth your two hours since not many people know that it's the sequel to Book of Circus and should only be watched if you’ve already seen Kuroshitsuji and Kuroshitsuji: Book of Circus. Anyways thanks for reading!